The two fixtures so far this season have ended in a goalless draw, and a 1-0 win for the Jambos at Easter Road, so Hibs will be keen to exact some revenge when they pitch up in Gorgie. Paul Heckingbottom’s arrival has resulted in an upturn in fortunes for the green half of Edinburgh, with the former Leeds and Barnsley boss enjoying an unbeaten start to league life in Scotland with two draws and five wins. Only Celtic have managed to defeat Hibs under Heckingbottom, but the 42-year-old knows the trip to Tynecastle will be a stern test for his side. Craig Levein, on the other hand, will be hoping his side can build on last weekend’s fine home win over away-day specialists Aberdeen can be the catalyst for a good derby performance that can then carry Hearts onto their Scottish Cup semi-final meeting with Inverness. However, there were 12 points between the two teams earlier this season - now a single point separates the sides. Victory for Hibs would see them leapfrog Hearts into fifth, while a Jambo success would see them keep the pressure on Aberdeen in fourth. A number of players could make their derby debut - Marc McNulty and Stephane Omeonga of Hibs, and Uche Ikpeazu and Conor Shaughnessy for Hearts. Neither team has any players suspended but there are three out for Hearts while up to six could be missing for Hibs. 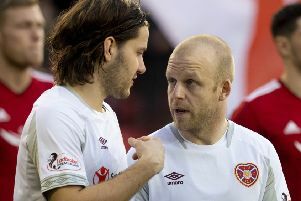 Hearts: Ben Garuccio (knee), Steven Naismith (knee), Demi Mitchell (knee). Hibs: Thomas Agyepong (recovery), Darnell Johnson (recovery), Martin Boyle (knee), Ryan Gauld (hamstring), Ryan Porteous (knee), Steven Whittaker (recovery). Hearts: Zlamal, Souttar, Berra, Shaughnessy, M Smith, Haring, Djoum, Mulraney, Wighton, Clare, Ikpeazu. Subs from: Doyle, Dikamona, Hughes, Brandon, Godinho, Lee, Bozanic, Burns, Hickey, Cochrane, Irving, Morrison, MacLean, Vanecek, Keena. Hibs: Marciano; Gray, McGregor, Hanlon, Stevenson, Milligan, Omeonga, Mallan, Horgan, Kamberi, McNulty. Subs from: Bogdan, Mackie, Nelom, Bartley, Spector, Bigirimana, Slivka, F Murray, I Murray, Shaw, Allan. The number of Tynecastle derbies to have been played since Hibs last recorded a win, in May 2013. Darren McGregor versus Uche Ikpeazu is a battle Scottish football fans are yet to enjoy. Expect no quarter to be given by either man in a tussle that could swing the derby. McGregor was benched for Hibs’ 0-0 draw with Kilmarnock in midweek, although he did come on as a sub, and is expected to start alongside Paul Hanlon at the heart of the Hibees defence. Marc McNulty will be hoping to hit the goal trail again after drawing a blank in his last two games - the on-loan Reading forward has scored four goals on the road since joining in January - while Stephane Omeonga could bring a bit of bite to the Hibs midfield. The return of Uche Ikpeazu will boost Hearts but Michael Smith being passed fit would be a huge boon - the versatile defender adds steel, experience and an attacking threat on the right side. Olly Lee has taken the most shots for Hearts this term, with 34, although striker Uche Ikpeazu has contributed 23 shots off target alone. Lee has also put in the most crosses (46) but is trailing Hibs winger Daryl Horgan, who has fired in 59 balls from the wings. Despite the presence of Florian Kamberi and Marc McNulty, Stevie Mallan tops the shooting charts for Hibs having enjoyed the mosdt shots in total (62), the most shots on target (26) and the most shots off target (36). Kamberi, however, has likely contributed to Mallan’s shots numbers as he is the most fouled Hibs player this season. The Swiss striker has also given away the most fouls of any Hibee. Ikpeazu has won the most fouls for Hearts while Djoum has given the most away. Willie Collum takes charge of this game, and will be assisted by Douglas Ross and David Roome. Alan Muir is on fourth-official duties.